William Carol Latham was born on August 29, 1960 in Birmingham, Alabama. The six foot two inch lefthander, was first drafted by the expansion Seattle Mariners in 1977 but did not sign. Instead he pitched for Auburn University getting signed as an amateur free agent by the New York Mets in 1981. He won 12 games at the A – AA levels in 1983, pitching for Lynchburg & Jackson. I 1984 he was promoted to AAA Tidewater after seven games, going 11-3 with a 3.06 ERA. 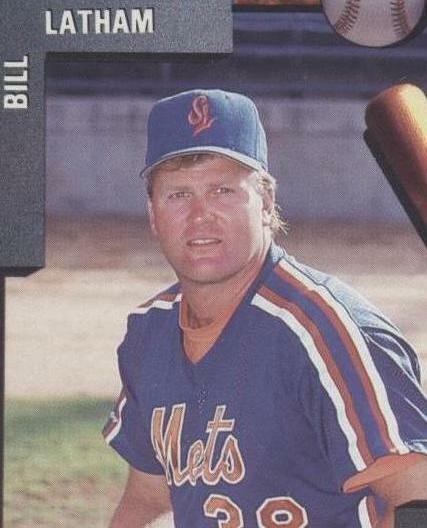 In 1985 he had a good Spring Training and found himself going North with the Mets big league team. On April 15th he made his MLB debut, giving up three runs on three hits against the Pirates, in Pittsburgh, taking a 4-1 loss. He then made a relief outing pitching two scoreless inning against the Phillies, but with such a talented staff was sent down to AAA Tidewater. He came back for one game on July 27th, having the best day of his brief MLB career. Latham pitched seven innings, striking out four Astros, allowing three runs and beating Houston 7-3 at Shea Stadium. He would go back down to Tidewater, going 13-8 with a 2.68 ERA & was brought back up in September. He made four appearances and took two losses, one in a start to the Montreal Expos on October 6th the final game of the regular season. In January 1986, he was traded along with outfielder Billy Beane and Joe Klink to the Minnesota Twins for Tim Teufel & minor leaguer Pat Crosby. Latham went 0-1 in seven games for Minnesota, then was traded Latham was 1-4 lifetime in the majors with 18 strike outs 13 walks & a 5.35 ERA in 14 games. In the minor leagues he was 63-51 in 164 games over eight years . 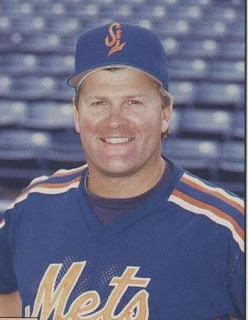 Retirement: After baseball he became a coach with the Aball St. Lucie Mets & later an MLB scout.